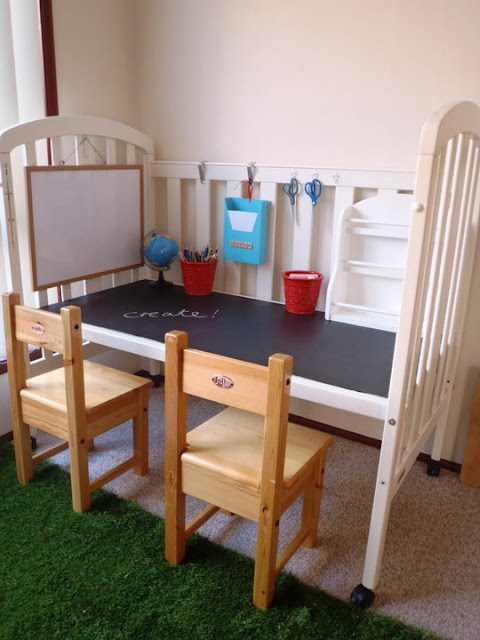 If you have any outgrown baby cribs lying around your house, you still can put it into good use by converting it into something that could be useful for your kids. Photo above shows a repurposed baby crib. An awesome way to create a lovely piece out of a home stuff that's already being ignored in one corner of the house. Side walls were kept intact and were used as an instant memo holder and a place to hang stationery items. All it takes is just a piece of plywood to cover the net of the crib which now used as desk. You can be more creative too by adding up more colors and lovely organizers to complete the look of your kids working area. And Oh, before I forget, I love the idea that it has wheels so it can be move to any part of the house. Awesome!